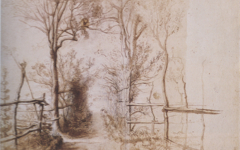 In 1505 Leonardo began to draw on a wall of Florence's Palazzo Vecchio. 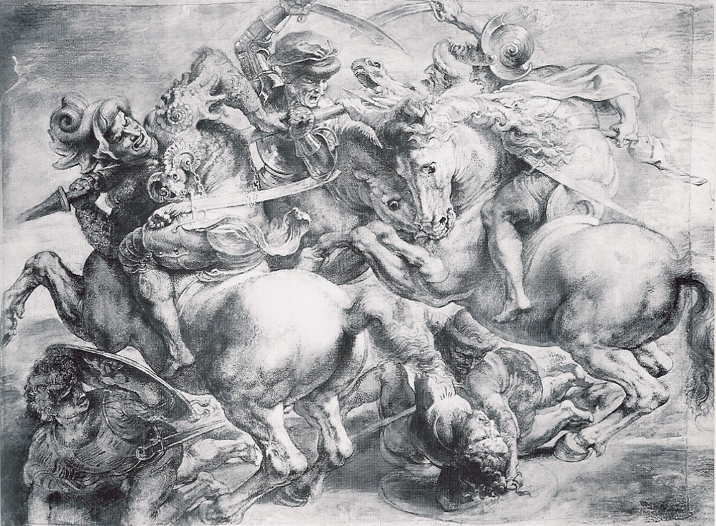 The mural was intended to commemorate a Florentine victory and would have been situated next to a commissioned (but also uncompleted) work by Michelangelo, the subject of which was equally self-referential. 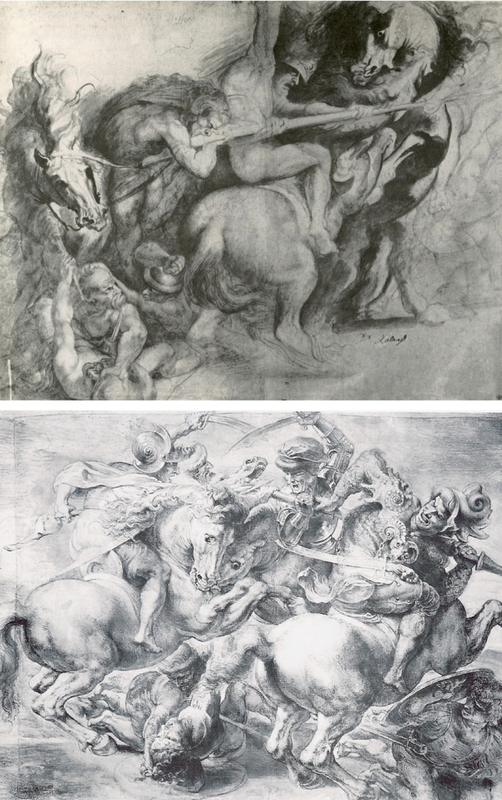 Leonardo's is now lost but Rubens drew a copy (left) which depicts a skirmish of mounted soldiers, some dressed bizarrely, as they attempt to capture the standard. Whose side each is on is far from clear. Besides, most seem less human than the horses. 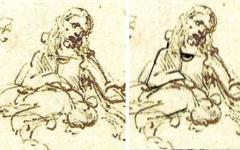 Rubens used figures from Leonardo's scene in several compositions. In one at left men and horses still battle over a pole of some kind. Whatever it is, it takes on added importance here as most of the eyes, equine and human, focus on it. Allegorically, though, it might well be "a giant paintbrush" or "a tool for drawing." If we invert the "original" (lower image) we see the horse on the left has become the man who tries to eat the pole like a horse (top). Conversely, the soldier right of center whose sword touches the upper edge (lower) is now the horse whose head swivels like the soldier's (top). The key, though, is in the lower left corner (top). There Rubens inserted an old man about to stab his enemy underneath who, in turn, holds a stick-like object, reminiscent of "a paintbrush." The man above, distracted, looks towards the motif; he is far too old for battle. Their outstretched arms too suggest that, like Narcissus, they are mirror-images of one another, their heads both turned. 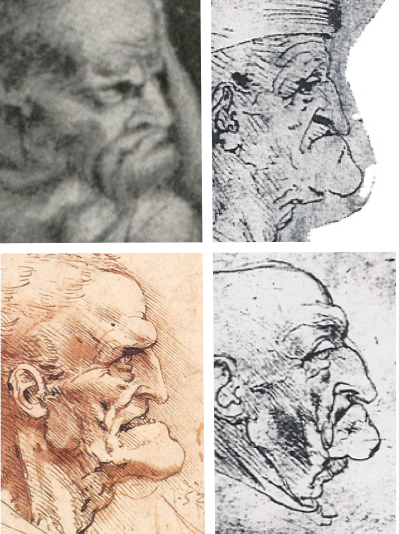 What no-one but artists may have noticed is that Rubens' veteran soldier (top left) resembles the "old man" heads depicted in so many of Leonardo's works (a variety at left.) 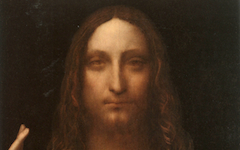 This "face" may not resemble Leonardo but, in a lower corner like a signature, it certainly represents him. Indeed the old man pictured over his mirror-image is Rubens' acknowledgement that he looks inward as well. What we see then, as in Leonardo's "original", is the creative struggle all artists go through in creating a masterpiece. Both artists envisage the violence of that mental anguish as a battle over the very weapon that will win the day, their paintbrush. 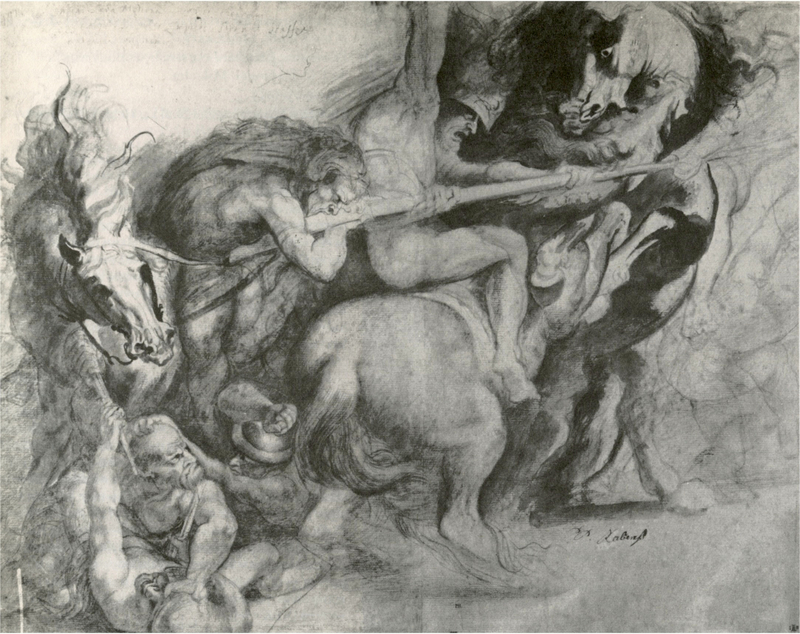 In addition, in identifying with Leonardo and his alter ego Rubens suggests that he and Leonardo, like man and horse, are interchangeable because deep down our true self is one and the same. Rubens advises here that wisdom cannot be found in the exterior world because, as all esoteric traditions hold, it is inside us. Divinity is inside; so Leonardo's Christ must be too. Original Publication Date on EPPH: 09 Jun 2012. © Simon Abrahams. Articles on this site are the copyright of Simon Abrahams. To use copyrighted material in print or other media for purposes beyond 'fair use', you must obtain permission from the copyright owner. Websites may link to this page without permission (please do) but may not reproduce the material on their own site without crediting Simon Abrahams and EPPH.